Happy 1st birthday to this beautiful boy! Everyday feels like Christmas waking up to next to my little nugget. The physical bond we share transcends time and space. Best friends for LIFE! We love you West! If you have a family Christmas pajama tradition, you know how fun it is for everyone to receive a new, comfortable set of jammies! Our personal highlight of this tradition is to get matching pajamas. If you don’t get holiday pajamas, this might be the year you want to start! There’s nothing better than curling up on the couch together with some hot cocoa and a good Christmas movie, with everyone wearing their pajamas. For me this tradition is all about family and togetherness. Nothing says togetherness more than matching right? We always wear them on Christmas Eve and continue to wear them throughout Christmas day as long as possible. Our personal favorites are from Hanna Andersson, for the long lasting quality, prints and styles. Along with the pajamas they also have some amazing clothing items! This year I wanted to share a little holiday gift guide revolving around pajamas! I’m sharing our favorites for all ages. Best part is that Hanna Andersson is having a BIG SALE! Now would be a good time to get over there, I know from personal experience they sell out fast! The sale details are: Cyber Monday 11/25 10PM - 11/29 12AM $25 off all kids pjs and an extra 40% off everything else! 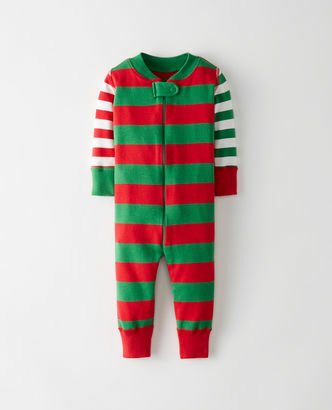 This Night Night Sleeper In Organic Cotton looks like the perfect holiday pajama for an infant. I love that this child size Long John Pajamas In Organic Cotton set can fit anyone from 18 mo.- 16 yrs. This adult Long John Pajama Top In Organic Cotton would be a good fit for man or woman. These adult Long John Pajama Pant In Organic Cotton could be a sleep staple year round. I personally love this Women's PJ Henley In Organic Cotton. You can’t beat these Women's PJ Pant In Organic Cotton. This Night Night Sleeper In Organic Cotton is one of my favorites. This Long John Pajamas In Organic Cotton could be a year long staple for any child. Women's PJ Henley In Organic Cotton looks flattering for any woman. These Women's PJ Pant In Organic Cotton look soft and comfy. This adult Long John Pajama Top In Organic Cotton looks perfect for my husband and myself. These adult Long John Pajama Pant In Organic Cotton look like the ultimate fit for any gender. This Night Night Sleeper In Organic Cotton is perfect, I only wish they had this fit in my size! I love these Long John Pajamas In Organic Cotton for all the kids. These Short John Pajamas could be worn year round. I love that Hannah Andersson offers different styles to accommodate everyones needs. This adult Long John Pajama Top In Organic Cotton can be worn by adults of all ages and genders. I’m all about these adult Long John Pajama Pant In Organic Cotton, they would be a staple in my wardrobe. This Women's PJ Henley In Organic Cotton can be worn by woman of all ages, it’s both stylish and top quality. I love these Women's PJ Pant In Organic Cotton pants. These Cozy Camp Socks look warm, soft and incredibly comfortable. The pictures below are a couple of items I wanted to share that my kids wear and love. These Carefree Cords are my sons favorite pants! My girls love this Velour Sweatshirt. I just purchased it in another color. These Velour Joggers are the perfect match with the Velour Sweatshirt. So soft and cozy. Everyday staple in our household with the boys. This dress is the my girls favorite. (I secretly wish they had it in my size) This classic cut is perfect for any occasion. All of these items could be used for that picture perfect holiday card or a family tradition you can carry on and share for years to come. It's always fun to get the whole family together to take family pictures wearing matching pajamas. Consider a matching family set for your whole family this year. Cheers to making magical memories all year long. Hi I’m Chelsea. This is my place to document whats on my mind and share the highlights of my life.